AleaSoft, March 25, 2019. 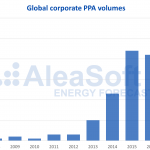 AleaSoft analyses the behaviour of the European fuels, CO2 emission rights and electricity markets, in a week in which the general trend of European markets prices fall in March continues due to the decrease of fuels prices, the spring arrival and a greater wind energy production. The Brent oil futures prices for May 2019 in the ICE market continue stabilized in a price strip between 65 $/bbl and 67 $/bbl since February 15, similar to the previous week, although a slight upward trend is observed with prices in the upper strip, closer to 67 $/bbl. On Wednesday, March 20, there was a punctual rise, reaching 68.50 $/bbl, a price that was not seen since the first half of November 2018. On Friday 22, the price settled at 67.03 $/bbl, returning to the 65 $/bbl ‑ 67 $/bbl strip. For the next few days, in the absence of relevant international events, the Brent price will remain below 68 $/bbl. The TTF gas futures for April in the ICE market, as in the previous weeks, continue with a downward trend since September 25, 2018, that is, six months ago, at the beginning of the descent. On Friday of last week, March 22, prices settled with a value of 14.45 €/MWh, which breaks the low record of the previous week, which was already the lowest value of the last two years. Taking into account the prices slope in the last days, in AleaSoft it is considered that in this coming week the downward trend will continue, with the possibility of falling below 14 €/MWh. As in previous AleaSoft’s comments, the evolution of API 2 coal futures prices for the month of April in the ICE market have remained much aligned with the TTF gas futures prices for this period. In March, prices continued to fall to 66.15 $/t, a value that had not been seen since July 13, 2017. As it was stated in the AleaSoft analysis of last week, taking into account the parallel evolution of gas and coal prices, the price of coal can fall to 60 $/t in the coming weeks, reaching the values of two years ago, as in the case of the gas price. The price of CO2 emissions rights futures for the reference contract of December 2019 in the EEX market settled on Friday, March 22, at 20.67 €/t. As in the previous week, in AleaSoft it is considered a trend to fall to 20 €/t as a reference for the coming days. This level may be broken downward to the extent that the Brexit negotiations will show a closer exit scenario. Taking into account the seasonal temperatures related to the spring arrival, the European electricity market prices had a pattern of continued slight decline since the beginning of February. The downward trend in the gas, coal and CO2 prices also influences the prices fall. As it was suggested in AleaSoft last week, it was also influenced by a relatively high wind energy production and a solar photovoltaic and solar thermal energy production that increases as the sunshine hours increase. Taking into account the prices of this week, there are two groups of markets. 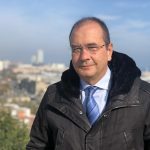 The N2EX market of Great Britain and the Italian IPEX market continue in the group with the highest prices , this time together with the MIBEL market of Spain and Portugal, all of them with prices around 50 €/MWh. In the case of Great Britain and Italy, the electricity market prices fall was influenced by the gas prices fall. In the strip with lowest prices are the Nord Pool market of the Nordic countries and the EPEX SPOT markets of Belgium, the Netherlands, France and Germany, with prices between 35 €/MWh and 40 €/MWh. In the case of France and Germany, the market prices rose with respect to the previous week due to a considerable drop in wind energy production. For the next few days, the AleaSoft’s forecasts do not show significant changes in temperature, but a higher wind and solar energy production that, with the expected decrease in fuel prices, will cause prices to continue with the downward trend. In the European electricity futures markets, last week of March 18 the price of April 2019 continued to fall, in line with the decline in fuel prices. In general, between Friday, March 15 and Friday, March 22, the decrease was between 4% and 7%. The futures for next April of Germany, France and Spain in the EEX market and those of Portugal in the OMIP market in the session of Friday March 22 registered the lowest settlement price since the product is traded. Also, in the EEX market, the Italian futures for the same product, registered the historical minimum settlement price last week, of 49.06 €/MWh, on Monday, March 18. During the past week, the wind energy production had a considerable drop in France and Germany. It also fell in Italy and to a lesser extent in Spain. 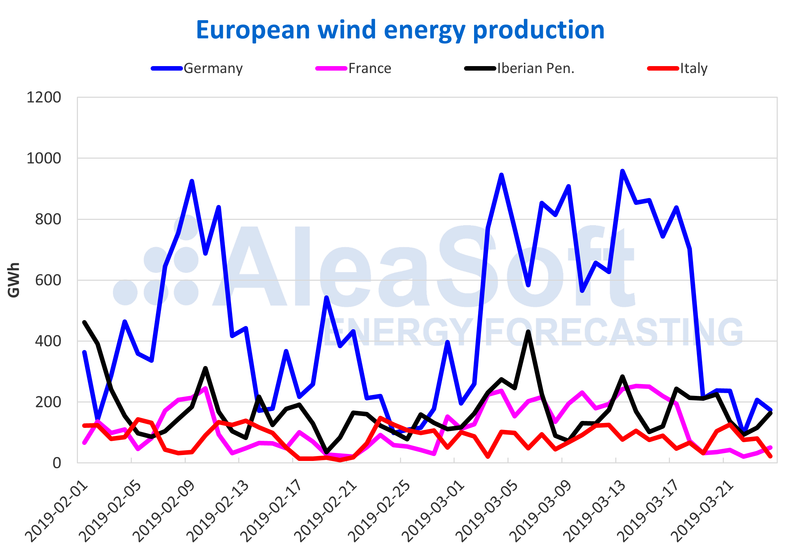 For the next week in AleaSoft it is foreseen that wind energy production trend will be reversed, that is, there will be generalized increases in all European countries. Last week the solar energy production, which includes both photovoltaic and solar thermal technology, had high values, especially in Germany with an increase of 111% compared to the previous week. In the case of Italy, the increase in solar energy production was of 12% while in Spain it decreased by 12%. 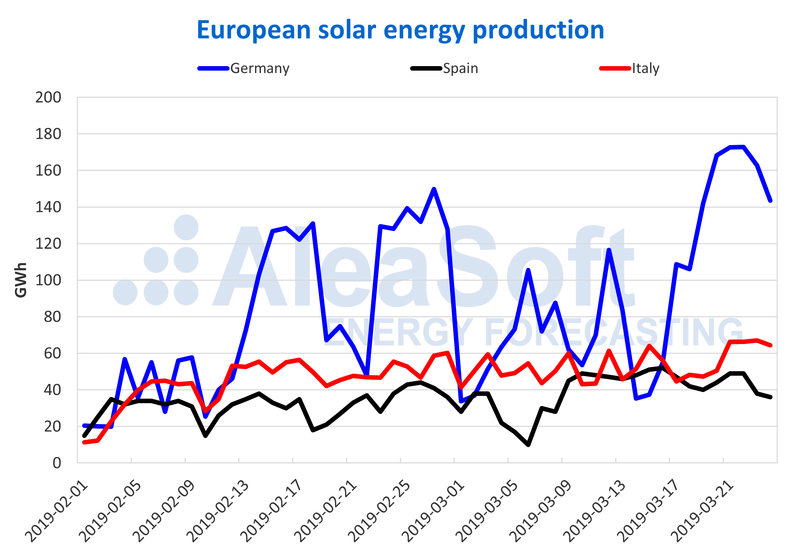 For the rest of the week, in AleaSoft it is foreseen that, comparatively, the production in Germany will decrease, and that it will slightly increase in Italy and in Spain. As we stated in AleaSoft in previous week, as there are more sunshine hours, the trend to increase solar energy production will continue until summer.